Pregnant women and one adult guest are invited to enjoy a walk-through tour of Sharp Mary Birch Hospital for Women & Newborns. 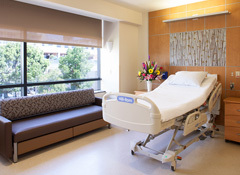 We will show you a labor/delivery and postpartum room if available. Please note that children under the age of 12 are not permitted on the tours due to infection control. This tour is also available in Spanish. Go to Recorrido Informativo de Sharp Mary Birch for dates and times.